There has been a lot of discussion about gender balance in Australian authors/award nominations etc over the last few years (most recently represented by some interesting posts by Ian Mond crunching statistics from the Ditmar awards – plus a follow up – and a guest post by Tansy Rayner Roberts entitled Is Australian Fantasy Dominated by Women on Cheryl Morgan’s website). I’ve found all these discussions very interesting and they have had an impact on my reading and writing. As previous posts on this blog have shown (e.g. my reading comfort zone), I’ve been trying to expand my reading of late, in particular attempting to read more broadly across Australian speculative fiction and participating in the Australian Women Writers’ 2012 Reading Challenge. While obviously the pursuit of gender equity in my reading will never be complete, I am interested in exploring other aspects of diversity in the Australian speculative fiction community. To that end, I’m attempting to seek out Australian Aboriginal or Torres Strait Islander speculative fiction authors. My search isn’t going too well so I suspect I’m not looking in the right places. So let me set a challenge for readers of this blog – any suggestions? 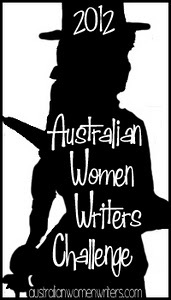 I’ve seen the Australian Women Writers 2012 National Year of Reading Challenge mentioned in a few blogs recently. It seems like a very positive way of promoting more gender equity in literacy circles, so I’ve decided to give it a go. I’ve chosen the purist (speculative fiction) genre challenge, and the Miles challenge level (i.e. read 6 books, review 3). In the back of my mind, I’m hoping I might get closer to the Franklin-fantastic challenge level, but I am aware that my day job and life generally can often get in the way of me reading as much as I’d like. Whichever books from the Twelve Planets series come my way in 2012, starting with Bad Power by Deborah Biancotti. I believe I should get at least 4 books through the Twelve Planets series. I’ve heard a lot of good things about The Courier’s New Bicycle by Kim Westwood. Power and Majesty by Tansy Rayner Roberts (I really enjoyed Love and Romanpunk by the same author, so looking forward to reading some more of her work). If I like it, then I’ll probably read the second book in the series The Shattered City. I’m not sure if this counts, but I’ll be reading the Above/Below double novella. Above is by Stephanie Campisi, which in my mind qualifies it. Below is by Ben Peek. Maybe that disqualifies it. We’ll see. You can find all my reviews for the challenge here. Some information from the challenge website follows. Objective: This challenge hopes to help counteract the gender bias in reviewing and social media newsfeeds that has continued throughout 2011 by actively promoting the reading and reviewing of a wide range of contemporary Australian women’s writing. Listening to podcasts such as Galactic Suburbia has elevated the profile of speculative fiction gender issues in my thinking recently. I never considered myself to be particularly biased in my reading or writing, but it has been very confronting listening to commentary making the point that if you’re not actively supporting gender and cultural diversity in the genre in your purchasing, reading and writing habits, you are effectively engaging in passive discrimination. I’m not intending to deconstruct the wide range of diversity arguments in this posting. Many clever people have done so much more eloquently than I ever could. Suffice to say that I have probably been guilty of not paying enough attention to who I’m reading and I do agree that you should attempt to read more widely than the traditional white, middle class male science fiction writers of yore. As mentioned in a previous post, my foray into writing has helped me expand my reading range and that has included paying more attention to the authors that I am reading. At the end of the day you will like what you like, but at least you’ll be making an informed choice knowing better the full range of work that is out there. Of course all this commitment to diverse reading habits is predicated on the assumption that no one is going to make me read the Twilight series. I think that’s fair. (As an aside, if you are wanting to read some excellent Australian female speculative fiction authors then can I suggest the Twelve Planets series coming out of Twelfth Planet Press, a small Australian publisher. Three of the planned twelve books out so far, all excellent. I believe the fourth book, Bad Power by Deborah Biancotti, has just been released and is hopefully making its way to me in the mail now – can’t wait). However, I have found one unexpected impact of all this enlightenment. Recently I’ve found myself a bit paralysed in my writing when it comes to representing female characters, or characters from different cultures. I’ve been told that so many things are wrong/insulting/biased that I can’t keep them all in my head. For example every time I put in even the smallest physical description of a female character I worry that I’m sexualising or stereotyping when I don’t mean to. When you get beyond the basics, some of the arguments about what is and isn’t offensive are sometimes a little esoteric (I keep having to look up the “stuffed into the fridge” (1) concept for instance) and don’t come to mind naturally – especially those that talk to unconscious biases that can be deeply ingrained in the culture you grow up in. I got to the point where I became so concerned that I would end up offending someone that I haven’t wanted to write anything at all. Then I started getting concerned that by not writing I was committing horrendous sins of omission. So, I’ve been giving this some thought over the last few weeks and I’ve come to some conclusions. Whether because it wasn’t caught by me in the writing process, or it is a bias that no one in my reading circle had recognised and brought to the surface, or I’m misunderstood somewhere down the line or because I’m just plain stupid, something will get out there written by me that genuinely and legitimately offends a group. I’m not talking about people just disagreeing with an opinion of mine – fortunately the world is too diverse a place to have everyone agree on pretty much anything. No, I mean I’ll represent a culture in a way that wasn’t meant to be offensive but is or inadvertently say something stupid and stereotyped about a female character. In that case, I’ll acknowledge I’ve made a mistake, try to learn from it and not do it again in future work. Re-reading this post, most of my conclusions seem like simple common sense. But there are a lot of well meaning people out there making valid observations about the biases and injustices that exist in the writing world, and it is easy to let it all overwhelm you. So that is all. No great insights or worthy additions to the conversations on diversity in writing. Just some fairly simple musings on how these issues have impacted my writing process. Have you had any paralysing moments in your writing or reading? I’d love to hear about them in the comments below. (1) “Stuffed into a fridge” – just so you don’t have to look it up (it can be disturbing what you find in Google when you type in something like “stuffed into a fridge”), the term refers to a plot device where a female character is killed off solely to further the journey of the male hero.